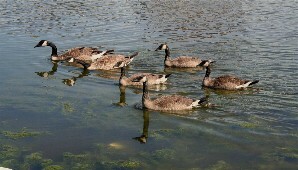 Beautifully written with delightful photographs by a lady with great love for geese! It is a miracle of nature that an egg becomes a fluffy, living ball that is capable of trotting, swimming, eating, and drinking in about 30 days. This ball of fluff breathes, cries, greets, and can feel happiness, sadness, and pain. It can also be shy or aggressive, domineering or dominated, stubborn or laidback. In ten weeks, this ball of fluff becomes a full-grown Canada goose that can sail high and far, its wondrous wild voice sounding across the vast expanse of sky. This is the story of ET. 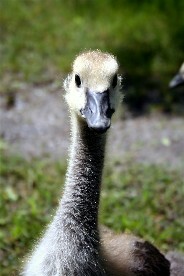 ET was one of seven goslings born to The Chesters on May 15, 2005. When ET made his way out of his shell, the first thing he saw was his mother. He had heard her voice when he was in the shell, comforting him whenever he cried. 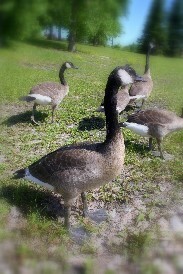 Now he fixed his eye on her, this beautiful Canada goose who had cared for him long before he set eyes on her. He wanted to place a picture of her face on his brain. She looked him over with her gentle, loving eyes and uttered a tender sound. He heard a low grunt and saw another goose. This goose was bigger. He brought his face close to ET's and poked him gently with his bill. ET blinked at the sight and sound of his adoring father. This new world was strange but he felt safe with his parents. He looked around when he heard soft peeping sounds and noticed that he had brothers and sisters. For the first few days and weeks, ET and his brothers and sisters stayed warm beneath their mother's wings whenever they were tired or cold. 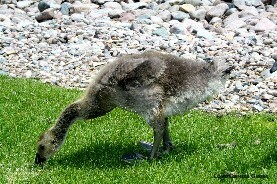 Often, they would peek their heads out through their mother's feathers and greet her with a chortle. For the first few days, they followed their mother in a tight-packed huddle and stayed close to her feet. His parents took them on a very long walk through strange places with strange sounds and smells. His father walked in front and ET and his siblings trotted in a straight line behind Dad with Mom bringing up the rear. It wasn't easy to walk because his body was round and often, he would tumble like a ball. 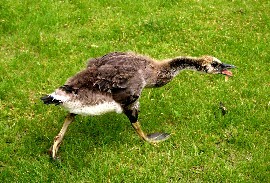 But his parents clucked at him so he got up just as quickly as he could and trotted along in between them. There were strange looking monstrous creatures who made loud growling barking sounds, sometimes frightening him out of his little wits. Whenever he felt cold and tired, he would make a little twittering sound and Mommy would stop, lie down, spread her wings and he and his siblings would toddle to rest and warm up beneath her wings. When ET was two-weeks old, he and his siblings still crowded beneath their mother's wings whenever they felt cold. 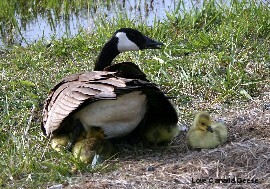 However, they would soon be too large to fit under mother's wings and they would sleep in a pile to keep warm. 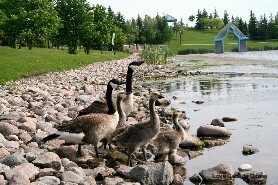 ET met other goslings at the park. In the photo above, he is 3 weeks old and his 2-week old friend is trotting along behind him. Sometimes, friends joined his family and his parents allowed them to stay. He had learned a lot of things in his short life: warning calls from his parents when they saw dogs or people they didn't recognize, new and delicious grasses and seeds to eat, cracked corn that nice people offered that tasted good. He also knew the pond and park very well. His parents led him and his siblings all over the park, investigating new places. He liked this park. It was a huge playground for him. There were plenty of spaces to run on and plenty of water to swim on. And he had a lot of friends to play with. Wing feathers began to sprout from ET's wings when he was a month old but his neck and the back of his head was still a fluffy downy yellow. 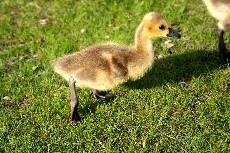 He began to grow little black tail feathers. Fluffy down stuck out of his ears and that's why a lady named him ET. She told him that he reminded her of someone in a movie! When he stood tall, he was now almost a third of his mother's size. ET was looking more like a goose every day. Strong flight feathers began to grow from blue quills on his wings. 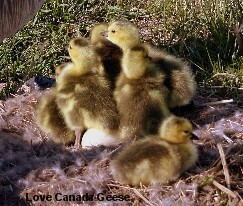 ET's cheek was beginning to show the white patches that is the trademark of a Canada goose. When ET was 7 weeks old, he began to look very much like his parents. In the image above, his dad, Chester Sr., is swimming at the top of the picture. 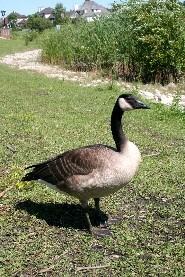 He's the largest Canada goose. ET's mother swims beside his dad. ET's markings are fainter than that of his parents. His neck is gray and his cheek patches are off-white. He is almost fully fledged. When ET was two months old, he was the smaller version of his parents. His white cheek pattern was becoming pronounced each day and in the days to come, he would have his own distinct pattern, different from his parents, his siblings and his friends. His long graceful neck was turning darker each day. He was now able to sound the Klaxon, although his honk was "broken" and sounded like yips most of the time. His soft musical whistle was still apparent because after all, at two months old, ET was still just a baby even though he was fast growing up. All this while, ET had been testing his wings. His short stubby downy wings grew longer and stronger each day. At one point, his wings seemed too big for him and he dragged them while they flopped about awkwardly. 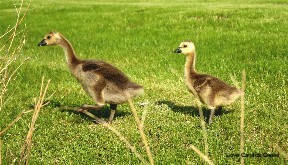 Then, one day, when he was nine weeks old, Mommy and Daddy flapped their wings and began to run across the water. They took off a short ways into the air! ET didn't want to be left behind. Anxiously, he flapped his wings and lo and behold, he was up in the air! He couldn't believe it! So that was the purpose of his wings! 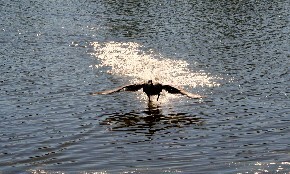 He could walk and run and swim and dive -- and now he could fly! ET's parents began to take him and his siblings away from the pond. Even though the trips were short and not very high in the sky, ET loved every second of it. The world looked different from up above. Ducks looked smaller and he could see his friends down below, cackling at him as he sailed above the trees. They wanted to fly, too. ET raised his voice in joy. His wings would transport him to a whole new world. At 10 weeks old, ET is fully fledged. His feathers will never be more beautiful than they are today because every feather is brand new. This picture was taken August 1, 2005. ET and his family had vanished from the park for five days. I had missed them and was thrilled to see them again. ET and his family left the park again after returning August 1. They were gone for 20 days. They remained at the park until their entire family, which consisted of ET's older brothers and sisters from previous years and ET's extended family of cousins, aunts, uncles, grandparents, and a few friends joined them at the park November 7, 2005. This was their staging ground. With a raucous cry of freedom and excitement, ET lifted off with his family into the overcast skies on the morning of November 8, 2005. He was about to embark on the trip of the ages, one that would take him to their favorite winter destination.